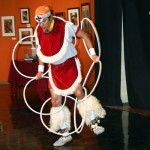 Edwardo Madril is a member of the Pascua Yaqui tribe of Southern Arizona and Northern Sonora Mexico. He is an active member of the Native American community and represents his culture as a dancer, singer, teacher, playwright and filmmaker. For the past 20 years, his involvement and commitment to native heritage has provided him with the opportunity to share a wealth of information with diverse communities. He has taught American Indian music at San Francisco State and was a three-year recipient of the California Arts Council Artist-In-Residence grant. As a dancer and educator, he has performed throughout the western United States, including the San Francisco Ethnic Dance Festival and World Arts West’s arts education program People Like Me. As a playwright and filmmaker, his works have been presented on stage in San Francisco at such venues as The Yerba Buena Center for the Arts and The Brava Theater. His short films have been accepted and featured in American Indian Film Festivals in San Francisco, Oklahoma and South Dakota since 2004. He has worked on films with other independent film directors and is currently acting in a feature film. He is also working on his first full-length feature film as a writer/director, to be released soon. 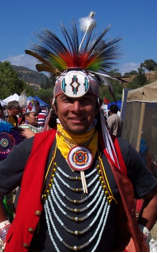 Eddie works with students to encourage the appreciation of and respect for American Indian dance, music, culture, history, art and sign language. Students learn Native American dances, music and traditional crafts, and the stories behind them.